It’s mid-August, which means that summer is nearly over and school is almost in session. For college students who live on campus the transition from the comfort of home to the dorm room can be quite difficult. The transition is also difficult for parents who have to make sure that their young scholars are prepared for life on their own. While it’s important to remember essentials like soap, toothpaste, towels, bed sheets, and clothes, here at Filters Fast we’ve compiled a list of back-to-school items that you may not have thought of or even anticipated. Students living in a dormitory on campus may not have continual access to water in the way they do at home. A Brita Pitcher allows you to fill up on water all at once and store it in your refrigerator. This “Slim Model” includes a pitcher with a filter to reduce lead, mercury, copper, and cadmium from water and is shaped to provide extra room in the fridge. Finding clean water is made simple with this pitcher filter that is affordably priced. In addition to ensuring that your children have clean water in their living spaces, be sure that they have a portable method of carrying water with them to classes. The Brita Water Bottle provides an option for filtering water on the go without sacrificing taste or portability. The bottle holds 24 ounces and can be refilled approximately 150 times before needing a filter replacement. Klean Kanteen water bottles are perfect for carrying water on the go, whether it’s on the way to class or for a camping trip. At Filters Fast we provide many different shapes and sizes for Klean Kanteen bottles which are BPA-free and made of food-grade stainless steel. They also feature attractive and durable designs in several color options. The Filtrete Water Station provides the clean water of a filter and the portability of a water bottle. Simply fill the station with water from the sink and the station will filter that water into 4 reusable BPA-free water bottles that you can take anywhere. This water station provides drinking water that is both portable and clean. In addition, the filter and the bottles are easily replaced. If your children have a refrigerator it’s important to make sure that the food in the fridge stays fresh. The Whirlpool Refrigerator Deodorizer fits easily onto the shelf of the refrigerator and leads to fresher, longer lasting produce and fruit. It also absorbs strong food odors for your convenience. Help your children maintain high indoor air quality in their dorm or apartment with this TrueAir Plug Mount Odor Eliminator. This air odor eliminator features a carbon filter that neutralizes and eliminates unpleasant odors while also freshening the air. This plug mount odor eliminator can be used in many different types of rooms and helps increase air quality. 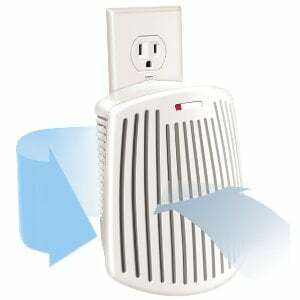 The TrueAir Room Odor Eliminator Air Cleaner is an air cleaner that keeps entire rooms smelling fresh and clean. This odor eliminator utilizes 3 carbon filters to trap and neutralize odors instead of simply masking them. Its compact size allows it to fit snugly in a small room in need of odor removal or air freshening. This odor removal tool has multiple applications, including kitchen, smoke, bathroom, and pet areas. In some areas air quality could be improved by having moister air. The Crane Ultrasonic Cool Mist Humidifier provides the additional moisture you need in this Drop Shape model that is both aesthetically pleasing and compact. The Crane humidifier provides relief for dry skin and the symptoms associated with coughs, colds, and the flu, and supplies indoor moisture for easier breathing and the relief of nasal congestion, dry cough, sinus irritation.